"Future generations will look back on the legalization of assisted suicide as the most important social, ethical, legal values decision of the 21st century." Road to Mercy documents Canada's journey into the furthest ethical frontier - a place where doctors are allowed to take a life and where society must decide on the circumstances under which they can. Through the stories of patients who seek medical aide in dying and the committed physicians who agree to help them, Road to Mercy chronicles Canada's first legal doctor-assisted deaths and peers into the extreme boundaries of this practice. Following stories in both Canada and Belgium, where doctor assisted death has been legal for more than a decade, Road to Mercy reveals the moral and ethical quandaries at the heart of this practice during a historical moment in Canadian history, when both patients and doctors are struggling to identify the limits of the newly granted right to kill and die under a broad Supreme Court of Canada decision - the first of its kind outside Europe. In February 2015, the Supreme Court of Canada ruled that a ban on doctor-assisted death was a violation of a patient's rights under the Charter of Rights and Freedoms. After years of debate and lawsuits, medically-assisted death is finally legal in Canada, following a decision by the Supreme Court to decriminalize it on February 6, 2015 in the Carter V Canada case. This landmark ruling allows doctors to help end their patient's life when, “consenting adults determine they cannot tolerate the physical or psychological suffering brought on by a severe, incurable illness, disease or disability”. In Road to Mercy we accompany Canadian doctors and their patients as they struggle to identify the limits of the newly granted right to kill and to die. 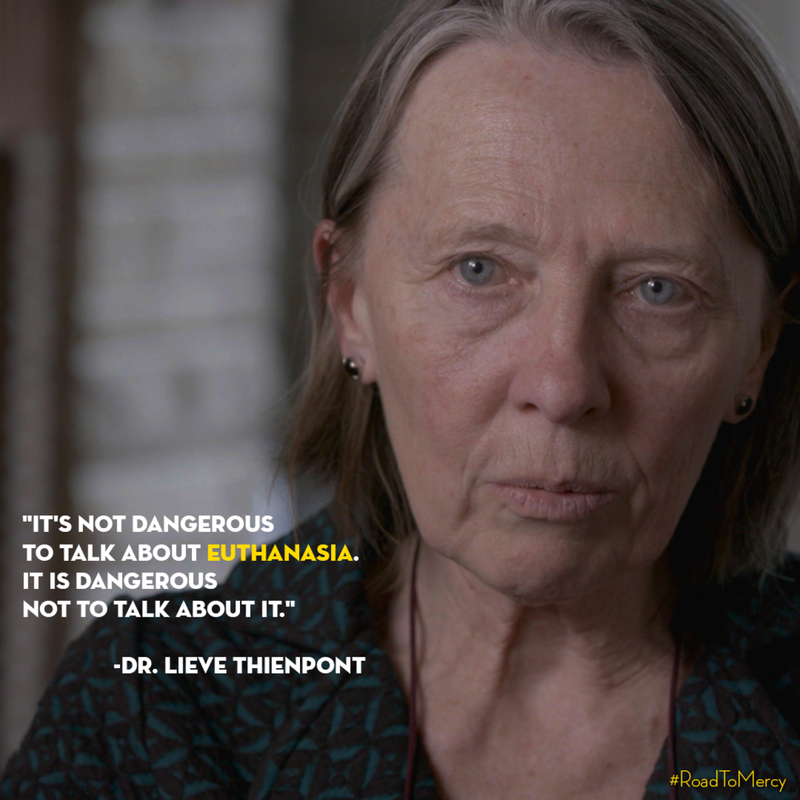 In Belgium, we meet bold physicians who go beyond terminal illness to provide assisted death for suffering psychiatric patients, a scenario that is legal both in Belgium and under Canada’s recent Supreme Court Carter ruling. Road to Mercy also explores perhaps the most confounding ethical quandary concerning medical assistance in dying – advance directives for dementia patients.